Most reviews so far on this tour have been favorable... Some reviewers get it... some reviewers don't, and that's totally fine, it's basically their personal opinion. 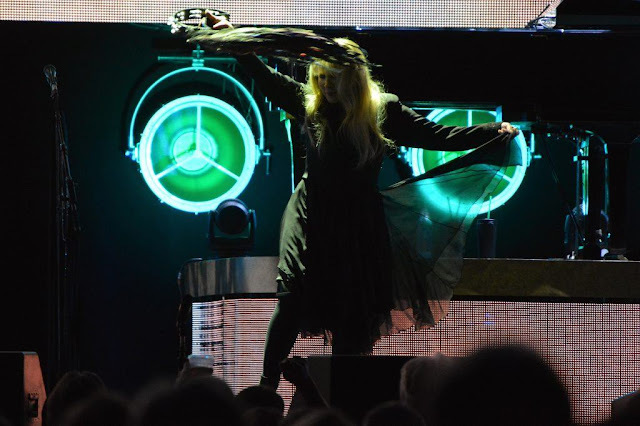 Roughly 5,000 classic rock fans braved a snowstorm to catch a “landslide” on Friday night, as the incomparable Stevie Nicks brought her 24 Karat Gold Tour to Rogers Arena. The singer, whose raspy voice and crazy vibrato dominated radio during the second half of the Seventies, recently released 24 Karat Gold: Songs From the Vault, a stunning compilation of shelved demos that spans her five decade-long career. And even though she has a tremendous catalogue of songs to choose from, Nicks kept her canvas relatively small on Friday, mostly concentrating on her work as a solo artist. So armed with what she called her “dark, mystical, gothic trunk full of songs”, Nicks proceeded to take Vancouver on what she called “a journey…through the snow.” Fans expecting a Fleetwood Mac retrospective were forced to make do with just a handful of Mac tracks (“Gypsy” and “Rhiannon” both made the cut), but the gold dust diva’s repertoire is so huge that it was easy to forgive a setlist omission here and there. Nicks’ performance was punctuated with lots and lots (and lots) of stories from her storied career. Some of them were fascinating, like how she wrote “Stand Back” as a companion piece to Prince’s “Little Red Corvette” and somehow convinced the Purple One to play most of the instruments on the song. But a lot of Nicks’ schtick fell flat, and one excruciatingly long monologue that involved a pregnancy, a dirt road, and an upright piano sent many fans to the bar for a break. When it came to the music however, the singer captivated the crowd with her haunting vocals and heartbreaking lyrics. Highlights included “Edge of Seventeen” and encore “Landslide”, and although she doesn’t try to hit high notes of the original composition anymore, her smoky, husky tone nicely complemented the song’s world-weary lyrics. And like her touring buddy, Hynde was also a fan of the Vancity Blizzard of 2017. “My guitar has some cracks in it from the cold weather,” she said. “But I’m glad that it has some scars from Vancouver!” Hynde later surprised fans by joining Nicks onstage for a duet of “Stop Dragging My Heart Around” which probably sounded cool on the tour bus but was a hot mess when we saw it. They missed notes, botched lyrics, and broke out into a full-on private conversation mid-song while their backup singers carried on without them. But the Vancouver crowd was so hot and bothered by the sight of two rock goddesses sharing one mic that they turned a blind eye (and a deaf ear) to the shaky performance. On paper, last night’s double-header of Stevie Nicks and Chrissie Hynde’s Pretenders at Vancouver’s Rogers Arena seemed like a match made in Queens of Rock heaven. The reality, as is often the case, proved different. The party pooper, it turned out, was Stevie Nicks. Promising a new type of set, featuring not just hits but personal favourites she’d unearthed and rerecorded for her most recent “24 Karat Gold: Songs from the Vault” album, the issue wasn’t the choice of songs, but the way she went about her performance. It all started so promising. Nicks was accompanied by Chrissie Hynde singing the Tom Petty parts for “Stop Draggin’ My Heart Around,” the Pretenders’ frontwoman unable to get all her words out after descending into giggles almost immediately. Hynde’s laughter was a rare moment of spontaneity. Instead Nicks chose to punctuate every song with a lengthy, egotistical and over-rehearsed anecdote about its creation. The music, when it eventually arrived, was well sung and polished; “Gypsy,” “Stand Back” and the timeless “Gold Dust Woman” all standing out. But by insisting on eating up endless minutes by trawling out irrelevant tales from her charmed life, what could have been a party often felt more like a series of history lectures. “I’m not wasting your time, am I?” she asked audaciously midway through introducing her band, a process conducted in a musical vacuum sucking up time that should have been spent playing at least two songs. The Vancouver crowd, polite to a fault, mumbled “No,” but they were thinking otherwise. The songs were the stars. The chiming powerpop of “Back on the Chain Gang” (seriously, what a great song) was followed by ballsy ballad “I’ll Stand By You” and the dreamy Kinks cover “Stop Your Sobbing.” The delivery was relentless. Resistance was futile. “Have we got time from one more?” asked Hynde at the show’s end. She didn’t wait for a reply, launching immediately into “Brass in Pocket,” a perfect finale to a great rock and roll set. No stories. No narcissism. All killer, no filler. You're right...some critics don't get it. Part of Stevie's charm is her onstage dialogue. It's what keeps her connected to her fans. Since both Stevie and Chrissie are human, they are going to forget things. Personally, I would like to see the critics do what they do and be perfect. The key, which I am sure they both know, since they are professionals is the ability to laugh at yourself. Thank you for keeping it real on this blog. Hands down, this is the BEST blog for information for both Stevie and Fleetwood Mac.